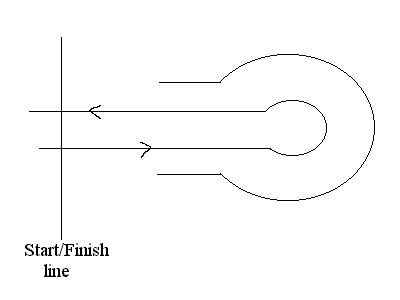 Riders enter at the red line, circle around the 1st barrel, proceed to the 2nd barrel, and then continue on to the 3rd where they will complete the pattern and finally exit the course crossing the red line a second time. This pattern is often referred to as a "Cloverleaf" The pattern may also begin with the left barrel first. Stakes to be set 100 feet apart and the second stake is to be 20 ft. away from the start line, with start and finish line being the same as all other events. The rider will start at the end of the arena, race down to the far pole and turn one direction, come back to the near pole and turn the opposite direction, go back to the far pole and turn the same direction as the first time, and then race back across the finish line at the end of the arena. If running two riders at a time, both riders will turn the same direction on the stakes, which will be determined before the event begins. Disqualifications - Knocking over a stake. Stepping on or over the start line once the pattern has been initiated. Crossing the center line if running two contestants at a time. Course to be set up with four flag stakes in a straight line 10 feet apart. A container to hold flags to be set 50 feet away from the first flag and 20 feet from the start line. 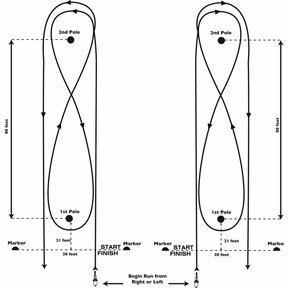 A rider crosses the line and runs to FIRST flag OR FOURTH flag, picks it up, returns to barrel and drops flag in barrel and continues consecutively up ( 1, 2, 3, 4) OR down ( 4, 3, 2, 1) the row of flags. After the fourth flag is deposited, crosses the finish line. A rider may start on either side of the flags but must continue picking flags from the same side throughout. Not picking flags in proper order either: 4, 3, 2, 1 or 1, 2, 3, 4. The keyhole is a 20 foot diameter circle with a slot 4 feet wide and 10 feet long. A starting line is set 100 feet back from the moutn of the slot. A rider is timed from crossing the line, running through the slot, turning and running out through the slot and back across the finish line. Horse must not step on the white marked lines. A judge is appointed to watch for stepping on or over the lines. Course will be set up using 5 poles as shown on the diagram. 2 poles will be placed four feet apart approximately 100 feet from the start/finish line. The next 2 poles will be placed 10 feet from the first 2 with the final pole in the middle about 5 feet from the second set of poles. 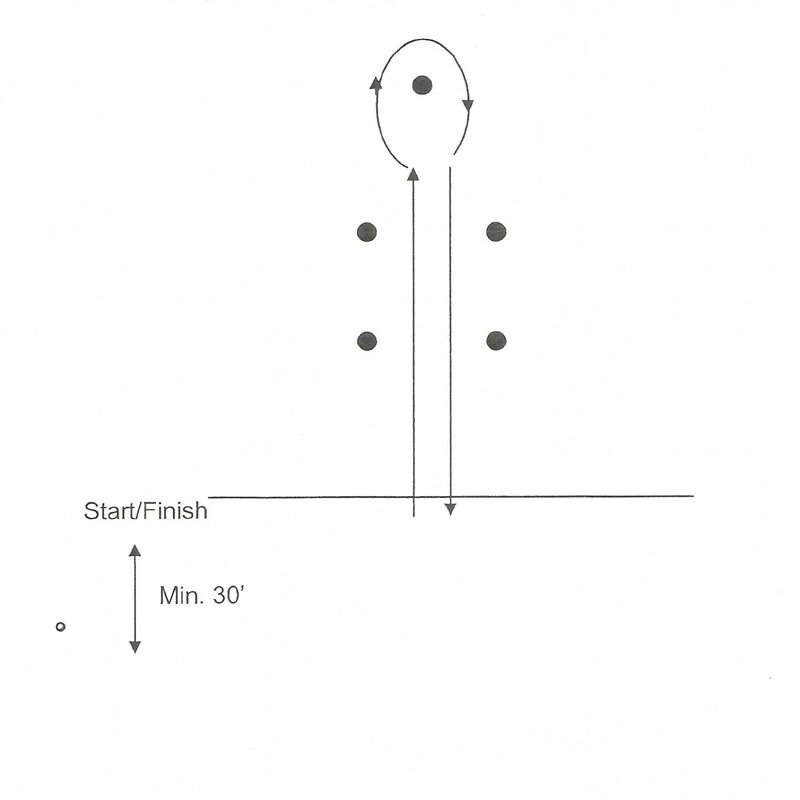 The rider will run from the start line between the first four poles, turn around the 5th pole (in either direction), run back through the four poles to the finish. A 3 second penalty will be added for any of the first four poles that are knocked over. Knocking over the 5th pole. Stepping on or over the start line before the pattern has been completed. 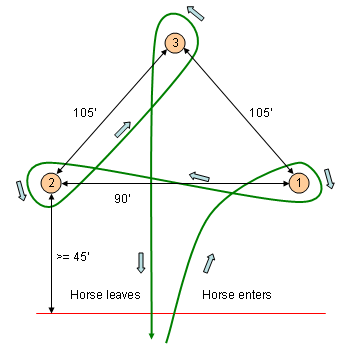 Going off course - If the horse and rider do not enter the poles through the middle of the first set, the rider may stop the horse, back him up and continue with the pattern as it should be. The rider may not turn the horse and return to where they broke the pattern or they will be disqualified. Crossing the center line if running two at a time.